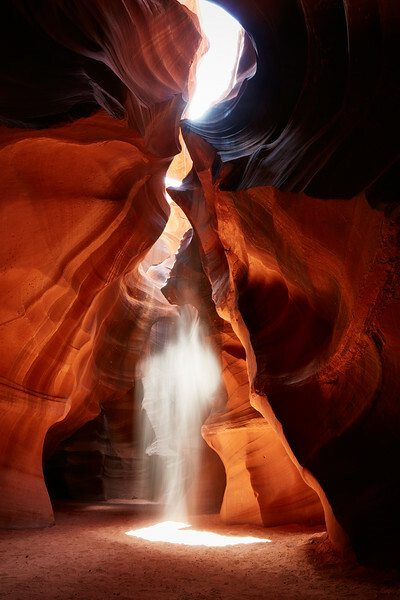 Upper Antelope Canyon is most famous for its light beams coming into the canyon. They are particularly visible when particles such as dust or sand is floating in the air and are great photo opportunities. It's maybe now even more famous after a press release announcing that a photograph taken by Peter Lik allegedly sold for $6.5 million in December 2014, making it the most expensive photograph ever sold. The black and white photo named Phantom (a colour version of the same photo was named Ghost) shows the phenomenon mentioned above, with the sand vaguely taking human shape when illuminated. I think I'm going to call my version "Spectre" and see how much it sells for.